KUALA LUMPUR: Property developer Khor Joo Saik Sdn Bhd expects to generate a rental yield of 10% within three years of operations of its Grade-A office tower, Menara Binjai. The building, which has a gross development value of RM180mil, is strategically located along Jalan Binjai and Jalan Ampang, and will be launched in the final quarter of this year, according to director Chua Guan Hock. “Our building is strategically located on prime (KLCC) land with a lot of amenities and a good transportation network,” he told StarBiz in an interview, adding that potential tenants would be offered a competitive rate of RM7.50 per sq ft. Khor Joo Saik Sdn Bhd owns the land where Menara Binjai is being built. “Good thing we don't have to buy the land with heavy borrowing costs. (Because of this) we have the strength to be very competitive with the rentals,” said Chua. Chua said he expected 75% of the offices to be taken up within the first year of operations, adding that the company was looking to attract tenants within the oil & gas, finance, services and trading sectors. “We have had enquiries from multinational companies as well as embassies as many of them (embassies) are located nearby. We're looking at a good balance of locals and expatriates (as tenants),” he said. Chua said another factor that made Menara Binjai appealing to potential tenants was the fact that it was a certified green office tower. 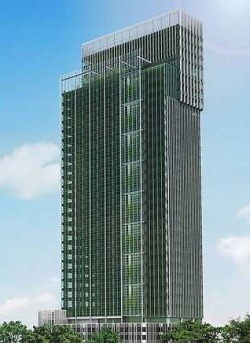 The tower has received the Green Mark Gold Certification (Provisional) by the Singapore Building and Construction Authority (BCA) as well as the provisional certification from the Malaysia's Green Building Index (GBI), making it the first dedicated office tower in the country to receive both awards. The 35-storey Menara Binjai will have four levels of basement parking and another four levels of podium parking. The office floors, which have a net lettable area of between 12,000 sq ft and 13,000 sq ft, start from level six onwards. “We're hoping to launch the building on Nov 11, which is a very auspicious date,” said Chua. SINGAPORE: Encouraging home sales continued over the weekend with MCL Land's Terrasse in Hougang finding buyers for more than 150 apartments. The homes at the 414-unit project in Hougang Avenue 2, whose preview started on Saturday, were sold at an average price of S$950 per sq ft. The 99-year leasehold project has homes ranging from 506 sq ft one-bedders to five-bedroom penthouses of about 2,210 sq ft. Ground-level garden duplexes have yet to be released. The Straits Times understands that a one-bedder will start from S$580,000 while a five-bedroom penthouse will start from S$1.85mil. All unit types received even interest, with 90% of the buyers locals and permanent residents. The rest were foreigners from countries including Malaysia and China. Far East Organization also saw 30 units across its properties snapped up by home buyers last week, excluding sales at Eight Courtyards in Yishun. Its Waterfront collection in Bedok Reservoir Waterfront Isle, Waterfront Key and Waterfront Gold sold 15 units in total while The Greenwood and Suncottages sold two units each. Woodhaven in Woodlands and Seastrand in Pasir Ris will start sales in the first and second half of next month respectively, The Straits Times understands. Online marketing material suggests Seastrand prices will start from S$850 per sq ft. Woodhaven's average price will range from S$900 to S$1,000 per sq ft. These prices do not factor in any possible early bird preview discounts. On the public housing front, this year's first executive condo launch, Belysa in Pasir Ris, had attracted 520 e-applications as of 8:30pm on Monday. This is about 1.7 times the number of units in the 315-unit project at the junction of Pasir Ris Drive 1 and Elias Road, which experts say is a healthy figure. Belysa illumination in Swedish will offer only three and four-bedroom apartments to cater to three-generational living. Priced at an average of S$670 per sq ft, the indicative price of an 829 sq ft three-bedder starts from S$574,000 while a 1,335 sq ft four-bedder starts from S$882,000. Sales bookings for units will start tomorrow. Experts said buying interest was still healthy for projects that were reasonably priced and in a good location. PropNex chief executive Mohamed Ismail said buyers had begun to accept that prices especially in mature estates, even in suburban areas could be about S$1,000 per sq ft.